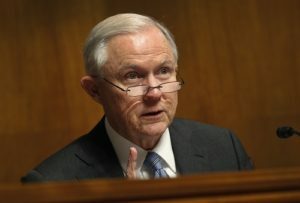 Attorney General Jeff Sessions acquitted himself quite well in testimony Tuesday before the Senate Intelligence Committee. Indeed, Sessions has been caught unfairly in a crossfire between Democrats and media out for blood, on one hand, and a self-absorbed and mercurial president, on the other. From the former camp, several Democrats on the Intelligence Committee were outlandishly rude, hectoring, and obnoxious in questioning Sessions Tuesday without giving him the courtesy of listening to his replies or even giving him time to reply. On the latter front, if reports are true that President Trump remains furious at Sessions for recusing himself from the Russia investigation, then Trump is both ignorant and way, way out of line. As Sessions made clear by quoting specific Justice Department rules, the attorney general not only was absolutely right to recuse himself from the Russia investigation but also was duty-bound to do so. Despite what the conspiracy-mongers imply, that obligation applied for reasons having nothing whatsoever to do with his involvement with any of the matters under investigation. And despite what Trump appears to believe, the recusal did not make it more likely — indeed, it could have made it less likely, if Trump had kept his mouth and Twitter finger stifled — for the Russia investigation to more thoroughly engulf the administration…. By the way, a note, for those who wonder about this: There is a good reason I can’t publish the entire articles here at my site, even if I wrote them. Almost all of these pieces are written for other publications, which own the copyright to them. Via fair use, I can quote a reasonably extensive excerpt, as long as I provide a link back to the original — but I am not allowed, by law, to publish the whole thing here.